Bengals are so much fun! Once you have one in your life you will always have a smile on your face. Check out our current kittens or Gallery of previous Kittens, or read on to learn more about these fun loving Cats. Bengals are intelligent, active, energetic cats. They are agile, love to climb and can be vocal with a distinctive voice, some would say they are more like a dog. My pet Bengals come walking with me around our property, constantly reminding me they are there and to wait for them. You guessed it they are the master and I am just the maid. Bengals love water and will often join you in the bathroom or play with water features in the garden. Nothing much will faze a Bengal, with their energy outgoing personalities life is so much better with one around. 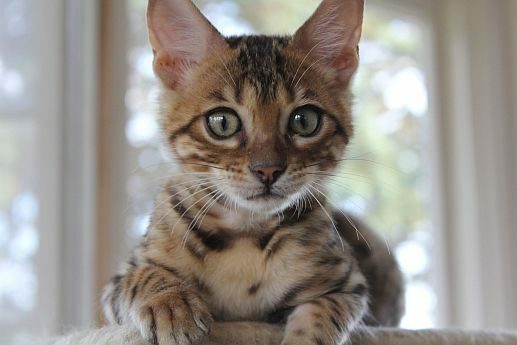 Bengals are well known for being like a dog, making them a great addition to your house and family. They get along well with other animals like birds and dogs. If you have other cats they tend to be the dominant one, it’s just the way they are. With a bit of training your Bengal will come when it is called. Bengals can be very talkative and will let you know when their food bowl is empty. With their distinctive voice you will know when your Bengal has entered the room! Some people say a Bengal is hypoallergenic. How can this be you ask? The answer is in their coats. Bengal cats have uniquely fine pelts that require considerably less maintenance than other breeds. As a result, Bengals don't groom themselves as often or for as long, so their fur contains less allergen-rich saliva. They also don't shed much, or shed far less than other cats, so whatever dander is present in their fur doesn't get spread around as much. We have had people get a kitten from us and their allergy has been ok. However, it really is an individual condition and what works for one person may not work for another. The Bengal is derived by crossing domestic cats with The Asian Leopard Cat. This results in a medium to large breed that resembles in miniature the mesmerizing, exotic looks, and attraction of the wild's big cats. Bengals really have that WOW factor when you first see them, owning one will change your life.